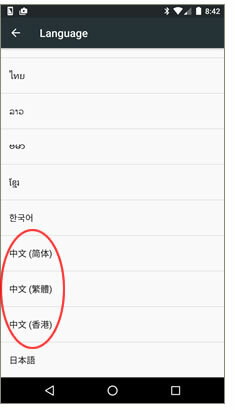 Q: I've just purchased an Android device, and Chinese not in the list of languages. I've added a Chinese keyboard, but I still can't make it work in Chinese. Is there a way to add this language? A: If there are no Chinese fonts or features on your device at all, adding a Chinese keyboard won't help. The best solution for non-developers is to buy another phone, sorry to say. The second-best solution could be a disaster for many. But first, let's make sure it's really not there. Go to Settings and scroll down until you find "Language and keyboard", "Language and input", or something similar there. Then look for something like "Language" or "Language and region". Scroll down and look for Chinese in the list, usually near the end, probably in Chinese: 中文（简体）, 中文(繁體) and/or 中文(香港). If it's there, see the introduction to Android Chinese features and other pages listed at the bottom of this article. If you don't see Chinese listed, I can offer some background and a possible solution, but you may not be happy. Chinese support is included in the standard Android OS, but many manufacturers leave languages out to save space or to combat gray market sales, and there is nothing Google and the Open Handset Alliance can do about it. Although there are a number of locale-related apps out there, those are more for customizing date display and other formats - like EU phone numbers in the US English locale - and I have received many reports that they don't fully install a new language. If you find something useful for non-technical users, please let me know. 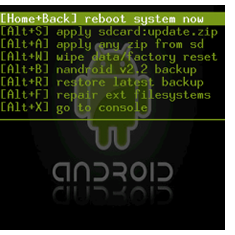 As far as I know, the only complete solution is to find a Chinese system ROM for your model phone, "root" your phone while connected to a PC, and flash in the new ROM. There are also partial solutions that involve adding only a font and other files, but you'll still need to root the phone for that. You can often find the files and instructions for your specific model on enthusiast sites like Android Forums or XDA Developers Forum. If you're a software engineer comfortable with Linux and embedded systems, maybe that will be worth trying. But is it a time-consuming task, and a scary portion of the people who try this wind up "bricking" their phone or tablet - it even happens to experts - so my best advice to most people is to sell their device on an auction site and buy a new one that includes Chinese.